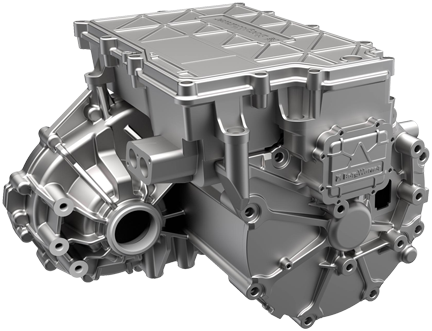 Borgwarner’s drive modules IDM integrate power electronics, transmission technology, and an electric motor with bar wound stator technology. The power electronics can be used with Classical CAN or CAN FD. While the forerunner – the electric drive module (EDM) – has already entered serial production, the fully integrated drive module (IDM) featuring specially developed power electronics is expected to follow as the next logical step, said the company. The product family is available in three different versions (IDM XS, IDM S, IDM M) and can be integrated either at the front or the rear axle of passenger cars and light commercial vehicles depending on the architecture and the application. Alongside pure electric vehicles, Borgwarner’s solution is also suitable for P4 hybrid vehicles, where the motor is located at the rear axle of the front-wheel-drive vehicle. The solution integrates power electronics with a transmission system and drive motor technology featuring the company’s bar wound stator solution to form a scalable package. The latest component of the drive modules – the integrated, specially developed power electronics – allows a package, low complexity, and minimum losses, explained the company. In addition, it offers full software functionality with an option for the high-level control of vehicle dynamics and energy management. The software architecture meets current market requirements and can be adapted to common platforms like Autosar as well as allowing safety aspects such as ASIL D to be realized. To handle the increasing volume of data exchange within modern vehicle systems, the power electronics can be used with a Classical CAN or a CAN FD network. In general, the key benefits of the IDM include its architecture and the range of gear ratios and electric motor sizes available, making it adaptable to customer demands. Operating at 250 V to 450 V of direct current (VDC), the product has exceptional torque and power densities ranging from 90 kW to 160 kW and 2 500 Nm to 3 800 Nm. All components used in the module are part of the company’s portfolio of technologies and are also available as stand-alone solutions. KEB has developed the Combivert T6 APD electric drive. It features a J1939 interface.